Welcome! You have reached the personal website of Lance Dean, an atypical 40 year old Mississippian. 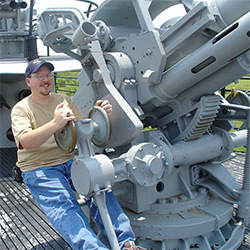 That's me on the right sitting in the trainer's seat on the 5"/25 gun aboard the USS Drum. This site revolves around my interests, which covers a wide array of things including my wife Emily, my daughters Kara Celeste (born June 2, 2009) and Leela Grace (born May 15, 2012), computers, forestry, HTML, the web, Mississippi State University, submarines, family history, the Nintendo Entertainment System (NES), Colt 1911 pistols, Remington 870 shotguns, Transformers, 3 ¾" G.I. Joes, and many more things. Want to see my personal internet index page? Check out http://www.LanceDean.com. I have numerous other websites that I maintain and they are all listed there. I've tried to keep that website as plain and simple as possible to keep up with myself on the internet. This website has been active since February 27, 2004. Yes, white text on a black background is hard to read. But I like it.